A flight plan does more than just lay out the route you'll follow on a cross country trip. A proper flight plan serves as an essential tool for use along the way, since it allows you to keep track of your position. In addition, it's enjoyable and satisfying to track your progress and keep updating your estimates en route. An effective flight plan need not be complicated, however, and you don't need a special printed form. Such forms are readily available, but I've been doing fine for years using a plain 8 ½ x 11 inch notepad, which I keep on a clipboard on my lap. You might want to do the same. The path of flight is shown in Figure 2-5. You'll depart Martha's Vineyard to the northeast, cross Nantucket Sound, and then intercept the Boston 334° radial and track it inbound. The route will take you north across Cape Cod Bay, with Massachusetts on your left and the Cape out to your right. You'll come in over the shoreline at Marshfield, and Logan International Airport will be directly ahead. Initial Planning. Before starting on a cross country flight, first study the appropriate chart and lay out your intended course. Then, after you've established the course you'll fly, break the flight up into a series of separate legs, so that each leg starts and ends with easily-identified checkpoints. Legs and Checkpoints. The first leg of this flight is from the airport to the point at which you intercept the Boston 334° radial; the first checkpoint, therefore, is the radial itself. The second leg is from where you intercept the radial to where you cross the shoreline at Marshfield; the shoreline, therefore, is checkpoint 2. 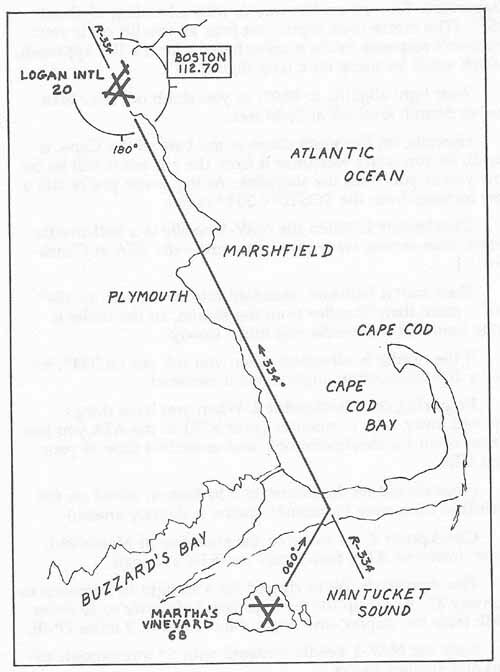 The third leg is from the shoreline at Marshfield to Logan International. Dead Reckoning. As you proceed en route, keep track of your progress along each leg. When you arrive at a given checkpoint, write down the time, and then figure about how long it will take to the next checkpoint. This is called dead reckoning, and you'll find it quite easy to do. Flight-Plan Format. The accompanying format for a simple but effective flight plan is shown as it would look just before you take off. Let's examine each element of the plan. Time Off. Your actual departure time, which you write down while on the runway when you're ready to take off. From and To. The starting and ending checkpoints for each leg of the flight. Alt. The altitude you plan to use on each leg. NM. Nautical Miles—the distance between the checkpoints for each leg, which you measure on the chart while planning the flight. ETE. Estimated time en-route for each leg, in minutes. This is the distance along the leg in nautical miles divided by the airspeed in nautical miles per minute. At a cruising airspeed of 120 knots, the airspeed per minute is 120 nautical miles per hour (120 knots) divided by 60 (minutes per hour), or 2 nautical miles per minute. Thus, with your airspeed of about 120 knots, a good estimate of the ETE is simply the distance along that leg divided by 2. For example, the first leg of this flight is about 24 nautical miles, so the ETE is 24/2, or about 12 minutes. ETA. Estimated time of arrival at the ending checkpoint for each leg. You fill this in while en route. Simply add the ETE for the next leg to the actual time it is when you begin that leg, and you have the ETA at the next checkpoint. ATA. The actual time of arrival at a checkpoint, which you get from the digital clock. On the Runway: Write down actual time off. On the Climb: Add 12 minutes (ETE for the first leg) to your time off, and you have your ETA at checkpoint 1. At Checkpoint 1: Write down time of arrival (ATA); then add 15 minutes (ETE for the second leg) to that time to figure the ETA for checkpoint 2. At Checkpoint 2: Write down time of arrival (ATA); then add 17 minutes (ETE for the third leg) to that time to figure the ETA for Logan. Note that an extra 5 minutes has been added to the final leg, to make a rough allowance for our lower airspeed during the approach to the airport. Turn right slightly, to 060°, as you climb out over Nantucket Sound; level off at 3000 feet. Hyannis, on the south shore at the base of the Cape, is small, so you won't recognize it from the air, but it will be below you as you cross the shoreline. At that point you're still a few minutes from the BOSTON 334° radial. Checkpoint 1. When the NAV-1 needle is a half-needle width from center, write down the time—the ATA at Checkpoint 1. Then start a half-turn, standard rate, to the left, to 334°. We're more than 50 miles from the station, so the radial is wide here and the needle will move slowly. If the needle is off-center when you roll out on 334°, try just a 10° interception angle to get it centered. Preparing for Checkpoint 2. When you have things squared away, add 15 minutes (your ETE) to the ATA you just wrote down for checkpoint one, and enter that time as your next ETA. Checkpoint 2. As we cross the shoreline at Marshfield, write down the ATA; then figure our ETA at Logan. The Approach. We're cleared for a straight-in approach to Runway 33. Be set up for the approach before we're 10 miles DME from the airport, and begin the descent at 9 miles DME. Keep the NAV-1 needle centered with 5° interception angles and shallow banks. When the runway becomes distinct, forget the needle and line up visually for the landing. Note that Logan also has a Runway 33 Right, but it's very short and is way down at the far end of the airport. You won't even notice it from the air. Runway 33 Left, however, is 10,081 feet—almost two miles long.